What can I do about inconsistent water temperature in my bath or tub? There are a few things you can try on your own in order to address this issue, including checking water heater settings and troubleshooting to the extent that you identify whether the temperature fluctuations occur throughout your home’s plumbing system or are isolated to just one faucet. Otherwise, we recommend calling a plumber to professionally diagnose and address the issue. In a recent article from the Wall Street Journal, it was determined that 112 degrees Fahrenheit was the ideal temperature for hot water. According the article, hot water heaters can provide water as high as 140 degrees, doctors recommend that heaters not be set higher than 120 in order to prevent injury. However, if you use water higher than 112 degrees, you begin to damage the skin’s lipid layer, leading to dry skin. Replacing the lipid layer gets harder as you age, so that’s why older people tend to suffer more from dry skin. And while that may be good advice for those seeking the perfect hot water for a shower, many suffer from inconsistent water temperature and other shower temperature problems. Even if you don’t set your water heater to 112 degrees, other issues within your plumbing system could lead to inconsistent hot water temperature. That kind of inconsistency can be frustrating, and even dangerous. While the occasional blast of cold water can be startling, a sudden increase in temperature can lead to scalding and serious burns. This is of special concern if you live in a home with young kids who may not be aware of the problem and don’t know how to avoid the problem when it does happen. That’s why we’re calling on our experts to help you solve your shower water temperature problems. Whether you are looking to troubleshoot water heater problems in your Harrisburg, PA home, or your temperature knob doesn’t match the temperature of your water in Carlisle, PA, let this be your guide on what to do when water temperature isn’t consistent. As the South Central Pennsylvania leaders in residential and commercial HVAC services, including plumbing, we know a thing or two about the problems that can affect your water temperature. Before we tackle solutions, let’s briefly discuss the most common causes of inconsistent water temperature. With a grasp of what causes inconsistent water temperature, you will be better prepared to address the issues efficiently. According to SFGate, showerheads vary greatly in output — anywhere from two gallons to 14 gallons per minute. Since the average residential water heater uses a 50-gallon tank, there is a chance that your inconsistent water temperature is due to insufficient tank size. This is especially true if you regularly have more than one shower running simultaneously or if you have installed multiple shower heads in a single shower. If you have two high volume shower heads moving water at 10 gallons a minute, your standard 50-gallon tank will only provide you with two and half minutes of hot water! Some people may notice that their hot water fluctuates when other appliances are running. That’s not uncommon, as these appliances will pull available water from your system and thus change the amount of either cold water or hot water running to your shower. For example, when a toilet flushes, it will pull cold water to fill up the tank. This can often cause a shower to become suddenly hot. On the other hand, if a dishwasher begins cycling to use hot water, it can cause a shower to become cold. Many homeowners have recently turned to tankless water heaters. These water heaters don’t store water for use. Instead, they create hot water on demand. Unfortunately, they may be prone to temperature fluctuations which are caused by cold water slipping through the system when the heater is switching modes. Finally, as temperature-regulating valves age, they can start to fail to properly control the temperature. Additionally, many older valves were not designed to handle the kind of hot water usage that has become common in most 21st-century homes. Moreover, older valves lack temperature balance features, which are very effective at maintaining water temperature conditions when there are fluctuations within the plumbing. As with any troubleshooting, your first step should be to isolate the problem. Start by testing the water temperature consistency when operating one shower without any other water-consuming appliances being used simultaneously. If you find that your water temperature is consistent under these isolating conditions, you can assume that the problem lies in one of the additional variables. Next try to use two showers at once. If you find that your temperature fluctuates under these circumstances, an insufficiently-sized water tank is probably to blame. While you should never try to disassemble a water heater without prior plumbing experience, you can give your water heater a quick visual inspection which may enable you to identify the problem. The following instructions are general in nature; you should always check your water heater’s manual for safe maintenance instructions before inspecting. If you have a gas-powered heater, you can visually check to see if the pilot light is still on. If the pilot light is not lit, you can attempt to relight it yourself. Typically, this involves turning the gas valve to the off position and waiting a few minutes. Next, turn the valve to the “pilot” position and then either use the onboard ignition switch or a stick lighter to ignite the pilot light. Once the pilot is lit, return the valve to the standard position. There are a lot of things that can cause a pilot light to go out, including moisture in the basement. However, if your pilot light is continually going out, then that is a sign of a larger issue, at which point you should consult a professional. If you have an electric water heater, you want to make sure the breakers haven’t flipped. Restarting your heater is as easy as flipping the breaker back. However, again, if your heater is consistently flipping the breaker, you should consult an electrician as you are likely experiencing a much more serious issue. Water heaters are installed with a safety feature that trips whenever water temperatures become dangerously high. Not unlike a circuit breaker, when this feature is tripped, it requires a reset. Resetting the thermostat is a simple procedure. However, if your thermostat is tripping regularly, it is likely there is a larger problem. One such problem is a faulty thermostat. It keeps getting tripped because it isn’t functioning properly. While this is an easy fix, unfortunately, it is not the most likely cause. The more common problem is a faulty temperature regulator. Your tank is designed to stop heating when the temperature reaches a certain level. If the automatic shut-off doesn’t activate, your water heater will continue to heat the water indefinitely. That’s why the emergency thermostat is so important. It completely shuts off the tank system to prevent this dangerous situation. 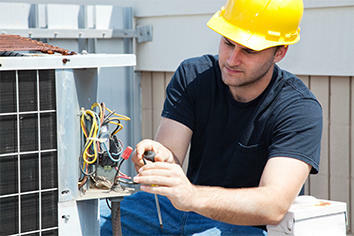 That being said, the uncontrolled heating issue is serious and requires a professional to properly repair your heater. A malfunctioning heater can be extremely dangerous – call a pro! Occasionally, homeowners notice that the temperature knob on their shower is inverted. When the control is moved toward the “H” for hot, cold water comes out instead, and vice versa. Unfortunately, this is usually the result of a poor faucet installation. It is an especially common problem for those who attempt a “do-it-yourself” plumbing installation. While newer shower installations are easy to use once installed, they often feature complicated components that require expert care when being placed in the wall. While an intrepid and experienced home plumber may be able to make the necessary repairs — which usually involves realigning a temperature-regulating cartridge in the faucet control mechanism — for most homeowners, this is a job best left to a professional. The main reason why a professional is best is because these cartridges are often delicate and require precision. While a do-it-yourselfer may succeed in the basic adjustments, the process may degrade the precision of the system, causing additional temperature fluctuations further down the line. As we mentioned before, appliance cycles are a common cause for temperature fluctuations. Thankfully, there are special valves designed to better regulate temperature during these cycles. Pressure-balancing valves react to fluctuations in water flow. If a nearby toilet starts to draw cold water, thus increasing the risk of scalding, the pressure-balancing valve responds by simultaneously regulating the hot water input, thus maintaining the cold and hot water balance that is delivering your desired water temperature. Specifically, these valves are designed to maintain desired temperature within a range of three degrees. Pressure-balancing valves are often standard in newer plumbing installations. However, homes with older plumbing often lack these types of valves. They are a relatively easy fix for a professional, and a simple switch from an old-fashioned valve to a pressure-balancing valve is a quick way to drastically improve your water temperature consistency. For those suffering through regular temperature fluctuations due to the cycling of a tankless water heater, there are solutions that still maintain the energy savings that make these heaters so popular. The most common solution is a mini-mixing tank. While a tankless water heater is more efficient because it doesn’t have to maintain 50 gallons or so of water at a specific temperature, the one advantage a traditional hot water tank has is its consistency. A mini-mixing tank is a great compromise. These do not store water long-term, but instead hold a small amount of water temporarily to provide a constant temperature when the tankless heater is cycling. While there are water temperature regulators installed on your water heater, many modern showers also come complete with an anti-scald ring. This is another layer of defense designed to ensure you don’t suffer accidental burns when showering. These devices work by regulating the maximum hot water to cold water mixture in your faucet. While these are incredibly important and useful devices, unfortunately they can be set with too low of a maximum temperature. It is possible to adjust your anti-scald ring on your own, but like the temperature-regulating cartridge, in order for this device to work properly, it needs to be adjusted precisely. Unless you are a confident do-it-yourself plumber, it is a job best left for a professional. Otherwise, you may go from having tepid water to having dangerously hot water instead. Unfortunately, your temperature regulation problems may be caused by a faulty faucet. While some faucets may be adjusted, sometimes these issues are beyond repair. This may be because the temperature-regulating cartridge is so damaged that adjustments aren’t possible. But if you live in an old house, you may simply have a faucet that was never designed to give you the level of control you need. In either case, a new faucet may be your best solution. In fact, as the prices of modern faucets continue to become more affordable, a simple replacement may be your most cost effective solution as well. One of the most common indicators of the need for a new faucet is a single shower that is causing problems while other showers seem operate normally. That means the problem is limited to one shower, and thus requires a localized solution. Finally, sometimes the best way to address insufficient water temperature is to simply expand the size of your water heater. If you have found that your water temperature issues correspond with an increase in water usage, say from a growing family, then your best bet may be to expand the capacity of your water heater beyond the standard 50 gallons. That being said, make sure your issues can’t be solved with smaller adjustments or replacements before opting for this larger overhaul. While a larger water heater may be exactly what you need, you don’t want to invest in this kind of installation until you are sure it is your best option. While it is true that money can be saved in the short term through do-it-yourself home improvement, when it comes to plumbing and water heating, it is important to know when it’s time to call in a professional. The truth is, a small mistake can have costly consequences. To begin with, leaks can gradually cause damage for a long time before getting noticed. In fact, small, almost imperceptible leaks often cause the costliest damage in the long run, because they are left for a long time before being repaired. Mold, structural damage, and more extreme plumbing issues can all result from an undetected small leak. That being said, one of the biggest issues with ill-advised DIY hot water repairs occurs when a hot water heater is improperly repaired. If you have a gas-powered hot water heater, a small gas leak could prove deadly. Furthermore, imprecise adjustments could result in dangerous water temperatures resulting in scalding injuries. While electrical hot water heaters may not pose a risk in the form of gas leaks, they are still subject to dangerously high temperatures. Furthermore, any device that combines electricity and water should be maintained with the utmost care. Either way, with the exception of basic adjustments, any repairs to a hot water heater should be left to those who are fully trained. If you do find yourself in need of a plumber and you are a resident of Carlisle, Chambersburg, or Harrisburg, PA, then look no further than Tuckey. We have years of experience offering the best plumbing services in South Central PA. Combined, our experts offer centuries of plumbing experience, meaning we have encountered the full range of plumbing issues. So if you are experiencing water temperature irregularities and you simply cannot figure out the cause of the problem, you can count on us to get to the bottom of it. Part of our recipe for success can be found in our consultative approach to plumbing. We know that your home, like all homes, is unique. So are your needs and desires. That’s why we take the time to get to know you and your plumbing. In doing so, we are able to address your particular needs, and we can design and implement a solution that is perfectly catered to you and your home. Furthermore, because Tuckey specializes in a wide range of mechanical services, including heating and air conditioning, we can tackle the needs of your home as a whole, not just the plumbing. This is especially important when dealing with hot water heaters. Many modern heaters are integrated within a wider system to lower energy costs while increasing efficiency. Because we are familiar with all of the residential mechanical systems that are installed in your home, we can make repairs and recommendations across systems. Finally, we are committed to preventive maintenance. When you employ us to provide such maintenance, you are making a much smaller investment to stave off potentially costly future issues. This is a far more cost-effective approach to plumbing, as future damage and costly total overhauls can be avoided. Additionally, regular maintenance is a great way to improve the energy efficiency of your system, further saving you money. So if you are a resident of Harrisburg, Carlisle, Camp Hill, or Chambersburg, PA and you find you are in need of a plumber, whether you are experiencing temperature control issues or some other plumbing concern, contact us today. Our professional and courteous staff are eager to connect you with a plumbing professional so you can get your hot water issues addressed quickly and effectively.